According to legendary entrepreneur Bill Gates, a successful team ‘acts with unity of purpose and focus’. The most successful sports teams invariably display a single-minded focus on performance and an ability to execute the manager or head coach’s game plan on the field. It makes sense then, when poor recruitment choices are made, that team harmonies can be disrupted, leading to below-par performances. Recruitment in sport, like any big corporate business, can have significant consequences that will both directly and indirectly impact revenue. A prime example of this is Championship team Stoke City, who reportedly spent over £50m on the likes of Giannelli Imbula, Saido Berahino and Kevin Wimmer in recent seasons. With Imbula spending last term on loan at Toulouse, the trio have struggled to live up to their sizeable transfer fees and Stoke’s ten-year spell in the Premier League ended in relegation in May. Often teams buy talented players and assume, because of their previous performances, they will adapt quickly to the playing style or culture of their new club – yet this is not always the case. Take Liverpool’s £32.5m purchase of Christian Benteke in 2015 and his sale just a year later for £27m to Crystal Palace. Did the Belgium international simply under-perform for Liverpool, or was he overvalued? The likelihood is a combination of both when you consider the playing style of Liverpool AND the tactical and physical traits of the forward. Of course, hindsight is a wonderful thing, but data available at the time suggested this may not be a match made in heaven. 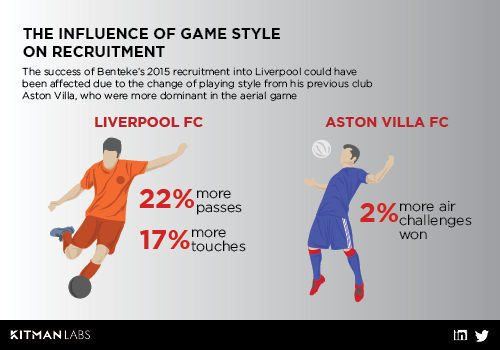 For example, the more direct playing style of Benteke’s former team Aston Villa, compared to Liverpool’s possession-based game, needed to be taken into consideration. During Benteke’s first season at Anfield, Liverpool made 519 passes per game while his previous employers averaged 403. Liverpool averaged over 730 touches each match; Villa averaged 611. Villa, however, was more dominant in the air. Considering the differences in style, the investment in Benteke came with some risk, and evidently it did not pay off. At 6ft 3in tall, Benteke is renowned for his aerial ability and over the last three seasons, one-third (34%) of his goals came from headers. Compare this to his former Anfield team-mate Roberto Firmino. The Brazil forward scores only 16% of goals (half of Benteke’s) with his head. Like everything in sport, there is an element of luck and chance involved in finding the perfect signing. 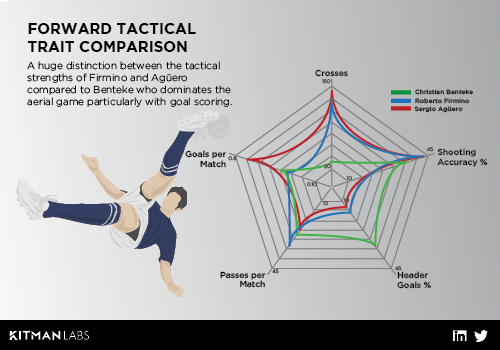 However, with the availability of so much physical and tactical data on all high-profile footballers, making more objective decisions is now possible and will greatly diminish the margin for error. Having the analytical tools or processes to leverage all the information being collected by teams gives clubs a truly objective means to assess the compatibility of potential talent and provides a massive advantage. What is the right process for scouts to use? 1. Understand what traits make a team successful in a given competition. 2.Determine the coach’s objectives and game plan for that season. 3.Identify the key tactical performance traits that are pivotal to executing this game plan. 5.Talk with the performance staff to understand the physical performance metrics that underpin the tactical traits required to fill in the gaps. A.This is essential to determine if a player can successfully transfer from a slower-paced game to a faster game without risk of injury or under-performance due to a change in training loads. B.It will also determine if a player has these qualities AND has the capacity to develop more to improve value. Money and mentality, other traits that should be considered. There are other elements to consider beyond the tactical and physical markers such as budgets and player value. Is the player currently overvalued or undervalued by the market? Will a transfer to your team increase their value? Also, many high-profile transfer moves have been undermined by off-the-field matters, like issues in a player’s personal life. Psych profiling a transfer target can offer a more complete picture and determine whether a player truly is the right fit for your club. In the business of sport, athletes are core assets and it pays for each club to put in place recruitment policies that reduce the risk of poor decisions. The complexity of scouting can be supported through better analytical processes that leverage all the data that is already being collected by teams. By taking a more objective approach to the recruitment process, teams will also have more success maximising the return on their investment through better performances or development strategies. By recognising how data can help clubs make smarter recruitment decisions, your team and business will continue to perform both on and off the field. 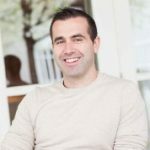 Stephen Smith is the CEO and Founder of Kitman Labs, a sports science technology company that works with over 155 elite sporting teams worldwide. Kitman Labs’ award-winning Athlete Optimization System™, which won the inaugural Performance Technology of the Year prize at the prestigious BT Sport Industry Awards 2018, uses machine learning and artificial intelligence to unlock unique insights about health and performance that helps elite sports teams succeed on and off the field.